Matthew Apgar - mapgar@shawmedia.com Connor Burns of Crystal Lake Central, top, takes control of Trey Fowler in their 120 pound wrestling bout on Thursday, Jan. 21, 2016 at Prairie Ridge High School in Crystal Lake. Burns got the pin in the third period and Crystal Lake Central won 51-21. 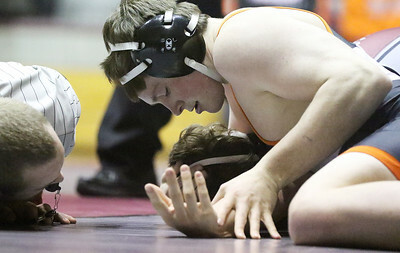 Matthew Apgar - mapgar@shawmedia.com Liam O'Donnell of Crystal Lake Central, left, takes control of Prairie Ridge's Brendon Ewing during their 160 pound wrestling bout on Thursday, Jan. 21, 2016 at Prairie Ridge High School in Crystal Lake. O'Donnell won by 8-6 decision and Crystal Lake Central won 51-21. Matthew Apgar - mapgar@shawmedia.com Keegan O'Donnell of Crystal Lake Central puts Mason Antonson of Prairie Ridge into a pin at the 41 second mark in the first period of their 195 pound opening wrestling bout on Thursday, Jan. 21, 2016 at Prairie Ridge High School in Crystal Lake. Crystal Lake Central won 51-21. Matthew Apgar - mapgar@shawmedia.com Frank Carone of Crystal Lake Central takes control of Prairie Ridge's Tyler Helsom during their 152 pound wrestling bout on Thursday, Jan. 21, 2016 at Prairie Ridge High School in Crystal Lake. 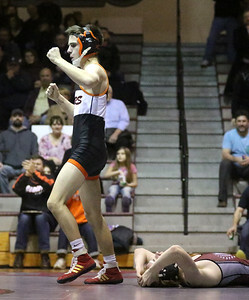 Carone recorded the pin in 3:35 and Crystal Lake Central won 51-21. Matthew Apgar - mapgar@shawmedia.com Lenny Petersen of Crystal Lake Central, top, puts Prairie Ridge's Trey Piotrowski into a pin in 3:03 during their 138 pound wrestling bout on Thursday, Jan. 21, 2016 at Prairie Ridge High School in Crystal Lake. Crystal Lake Central won 51-21. Matthew Apgar - mapgar@shawmedia.com Connor Burns of Crystal Lake Central celebrates his third period pin on Prairie Ridge's Trey Fowler in their 120 pound bout on Thursday, Jan. 21, 2016 at Prairie Ridge High School in Crystal Lake. Crystal Lake Central won 51-21. 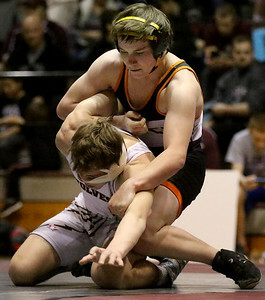 Matthew Apgar - mapgar@shawmedia.com Liam O'Donnell of Crystal Lake Central, top, takes control of Prairie Ridge's Brendon Ewing during their 160 pound wrestling bout on Thursday, Jan. 21, 2016 at Prairie Ridge High School in Crystal Lake. O'Donnell won by 8-6 decision and Crystal Lake Central won 51-21. 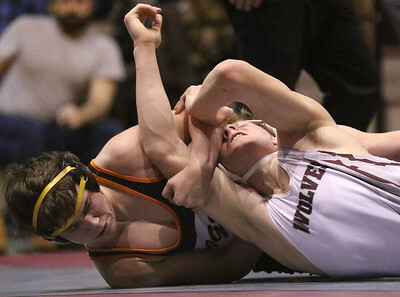 Lenny Petersen of Crystal Lake Central, top, puts Prairie Ridge's Trey Piotrowski into a pin in 3:03 during their 138 pound wrestling bout on Thursday, Jan. 21, 2016 at Prairie Ridge High School in Crystal Lake. Crystal Lake Central won 51-21.